The State Department has denied the claim. A Taliban official on Wednesday said the United States has promised to withdraw half of its troops from Afghanistan by April, a claim the U.S. State Department immediately disputed. "The Americans have agreed to us that half of American forces will start leaving from beginning of February till end of April," Hanafi told reporters Wednesday, saying the promise had been made during breakthrough talks with U.S. negotiators in Qatar's capital Doha last month, which he had taken part in. A State Department spokesperson though disputed that, telling ABC News, “We have not agreed to any timeline for a possible drawdown of troops and are not going to get into any other specific details of diplomatic conversations." Hanafi's comments come a week after Taliban and U.S. negotiators at the Doha talks announced that they had in principle agreed to a framework for a deal which could potentially lead to full peace talks, raising hopes that an end to Afghanistan's 18-year war could be closer. Under that deal, the Taliban would pledge that Afghanistan would never become a base for international terrorist groups again, allowing the U.S. to make a full withdrawal of its troops. The U.S. has said that for a full withdrawal to take place, the insurgent group would also have to agree to a cease-fire and start direct negotiations with Afghanistan's government. (Jalil Rezayee/EPA via Shutterstock) U.S. soldiers attend a training session for the Afghan Army in Herat, Afghanistan, Feb. 2, 2019. The Department on Wednesday repeated that the U.S. wants to reduce its forces in Afghanistan and referred to the guarantee that the country not be used for terrorism as a condition for that. The Pentagon and the White House did not immediately respond to the Taliban official's comments. "I want the right capabilities here, not necessarily specific numbers, so I'm always looking to reduce where I'm able to, and be as efficient as possible," he said." In Moscow the Taliban delegation reiterated the group's demand that all U.S. forces withdraw from Afghanistan. The group's representatives have been taking part at the highly unusual meeting with key Afghan powerbrokers, among them Afghanistan's former president, Hamid Karzai, who have said they hope the event can build trust and lay a foundation for a possible political settlement in the future. Afghanistan's government though has refused to attend the talks in Moscow, criticizing them as undermining its legitimacy. The government, led by president Ashraf Ghani, is already uneasy that it has been sidelined from the U.S.-Taliban talks and faces the challenge of other powerful political figures in Afghanistan seeking to take leading roles in the burgeoning peace efforts with the Taliban. 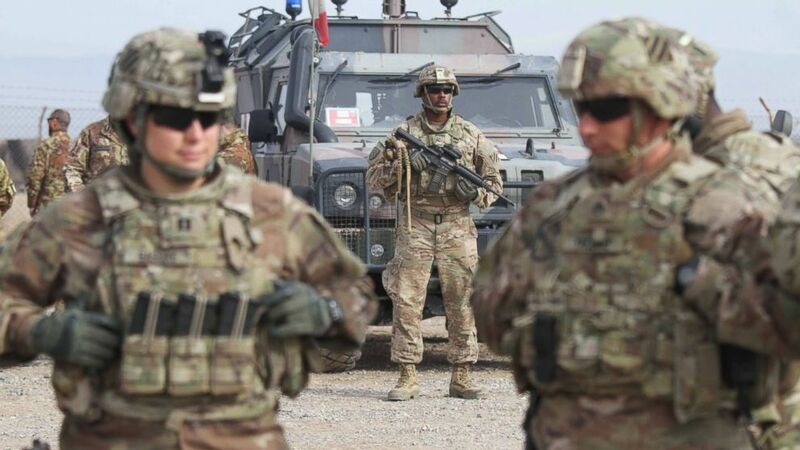 Afghanistan's government is anxious that a sudden U.S. exit could see it rapidly weakened and there are worries the country could fall further into violent chaos or renewed civil war as other warlords emerge to compete with the Taliban. Ghani in a tweet said that Pompeo had "stressed that there is no uncertainty and ambiguity about the U.S. commitment to Afghanistan" and that Pompeo had "underscored the central importance of ensuring the centrality of the Afghan government in the peace process." A readout released by the State Department, however, said Pompeo had also emphasized the importance of an "intra-Afghan dialogue" and expressed the U.S. determination to find "the conditions for the Afghan government, other Afghan leaders and the Taliban to sit together and negotiate a political settlement." ABC News's Conor Finnegan contributed to this report from the State Department.